There is something about the human condition where, when we see a disabled car or an accident, we slow down to gawk. Having lived in Chicagoland for over 30 years now, I have, sort of, trained myself that if I'm driving, I try not to look. It's incredibly hard, but my eyes must be trained forward and not fixated on the shoulder. It's the same with television. We love to watch other people's misery. The huge popularity of reality television bears witness to this. We spend our time glued to the flickering LCD screen as people we'd never associate with in real life scream, yell, kiss, make up and out and generally live within the glare of a camera. Spending my nights in a hotel room gives me ample time to watch enlightened television such as "Mythbusters" or the car wrecks of life that are hoarders. My last night in Prairie du Chien, I was up late watching back-to-back episodes of "Hoarders". I would not make time in my life, if I had cable, to watch this program, but, once on the hotel TV, I couldn't turn away until they repeated a program I saw already that evening. Hoarding is a psychological problem. It is a recognized disease and usually manifests itself with obsessive-compulsive disorder and depression. Medication and psycho-therapy are required as well as the recognition by the hoarder that they have a problem and want that problem handled. Of the 8 people profiled in the 4 hours I watched, one had relapsed, one could not move back home until other issues were dealt with and one had other psychological issues come out which had been buried in the hoard. It's easy to be on the outside and think, "How can people live like this?" In my years of doing inspections of properties for my job, I have encountered several hoarding situations. There have been houses where there was a trail from room to room with stuff piled everywhere. I look at floors, walls and ceilings when I inspect a property. I don't usually comment on what I see unless, for instance, I saw an item in a woman's sewing room that I admired. She was working on a quilt for a soon to be born granddaughter and her work was exquisite. Of course I'm going to comment on that. But I have been inside homes where I've actually thought, when I've left, "I should burn these shoes." Now, I'm not the most tidy of housekeepers. There's dust on furniture and cobwebs in corners. I need to wash the bathroom and kitchen floors. But you can walk into my house and not worry about piles or a trail from room to room and there is, unless I'm baking, room on the kitchen counters for dirty or clean dishes or to empty grocery bags. I have been in homes where there is no room on counters or tables and I wonder how long some of those dishes have been dirty. I watched, transfixed, as professional cleaners in hazmat outfits with respirators, went into some of these homes to clean them. I watched, again, it's like a car wreck on the side of the road, as people had melt downs when faced with the need to get rid of things. Families screamed at one another, came apart, applied a veneer of civility to the problem and dove back in. And I thought about my home and myself. It's easy to use stuff to fill emotional voids. I think, at a basic level, we all do it at some point in our lives. It's not all the time if you are healthy, but it happens to the best of us. Plus, we want to surround ourselves with beauty or items that remind us of travel or events we have enjoyed. There is nothing wrong with collecting postcards of places you've been or music or Pez dispensers. It's when you keep everything and can't part with anything that there is a problem. I love books. I love being surrounded by books. I have a collection of hand bells. People would buy them for me in their travels and I would get them as I traveled. I have a collection of the "Autum Leaf" style of Jewel Tea china. I like the design of the pieces. I have lots and lots of music CDs. I have a stash of candles and my secretary display cabinet is filled with knick knacks which have meaning to me. As I watched people's lives going out their door and into dumpsters, I thought of what I have and came to a conclusion I have toyed with but never really voiced. I have too much stuff. Granted, it is nothing like the 28 year-old woman who had every piece of clothing she had ever worn for the last 15 years stuffed in bags throughout her house, but I do have a lot of stuff. I would like to display my bells. I would like to use my Jewel Tea. One of my friends has suggested I upload all my music to "the cloud" and then I could get rid of the CD's. When was the last time I actually sat down and read "Just So Stories" by Rudyard Kipling? I can't honestly remember. In the northwest corner of the living room is a bookshelf with cookbooks, cat books and my college literature books in it. 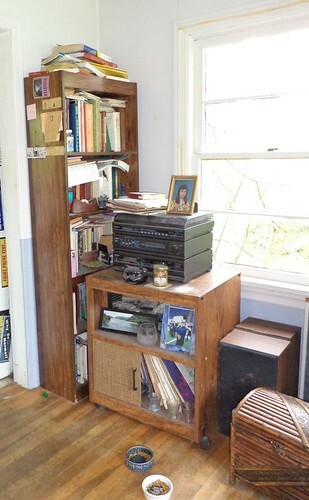 In front of that sits a rolling cabinet with records in the bottom and a record player on the top of it. I don't remember the last time I actually played a record. I also can't tell you if the player works. I think it does. I have decided to start here and work my way through my house, using up, getting rid of, sorting, cleaning and organizing what I own. I have decided to divest myself of those things I don't use or which I have just because I can possess them, not because they have any meaning to me. I'm going to read up on selling things on eBay and those records contained in this cabinet are gone. If I really want the music on them, I'll make a note of the artist and record and buy it in CD form or add it to my "wish list" for birthday or Christmas. There are collectors out there for whom this stuff would be worth something. It's time to be rid of them. The record player can be donated to the next group that calls asking for donations. In that space, I'm going to actually buy a cat tower for the girls to look out the window. I will go through that bookshelf with a critical eye. I don't want anything piled on top of it anymore. I have dozens of cookbooks, yet I eat ice cream sandwiches for supper because I'm too tired to cook. That corner shall be redeemed. There are no illusions this will be an overnight event. It could be but I think, in my radical purge mode, I'd get rid of something I truly want. Step by step, inch by inch, shelf by shelf. I'm not a hoarder by the clinical definition. I have stuff. Some of this stuff is representative of who I am. Some of it filled a void I have learned to fill in other ways. I'm reminded with this coming in spring, that pruning a bush makes it blossom better, fuller, happier. I look at this project to take a long time but, when I fully feel it's done, I will be better and happier. If you are interested in the records or books I will be selling, leave me an email. I pass no judgement on the state of your hoard but I'm happy to move those from my house to yours.